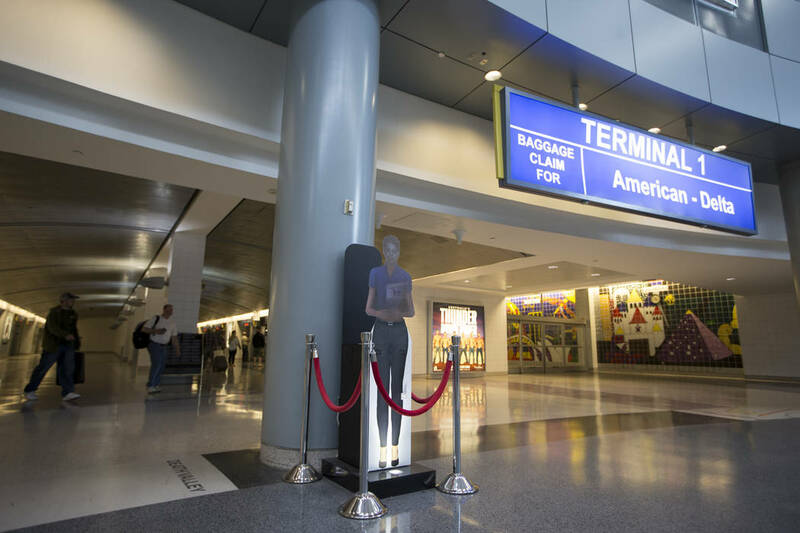 A team of three hologram workers has popped up at McCarran International Airport to help direct passengers toward tram connections headed out of the D-Gate satellite concourse. 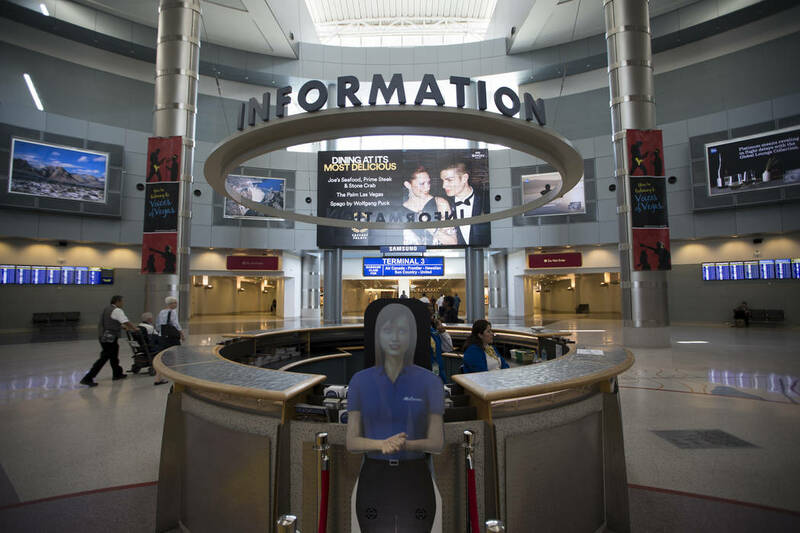 They’re slightly creepy and definitely kooky, but they’re supposed to make the airport a little less spooky for travelers passing through Las Vegas. 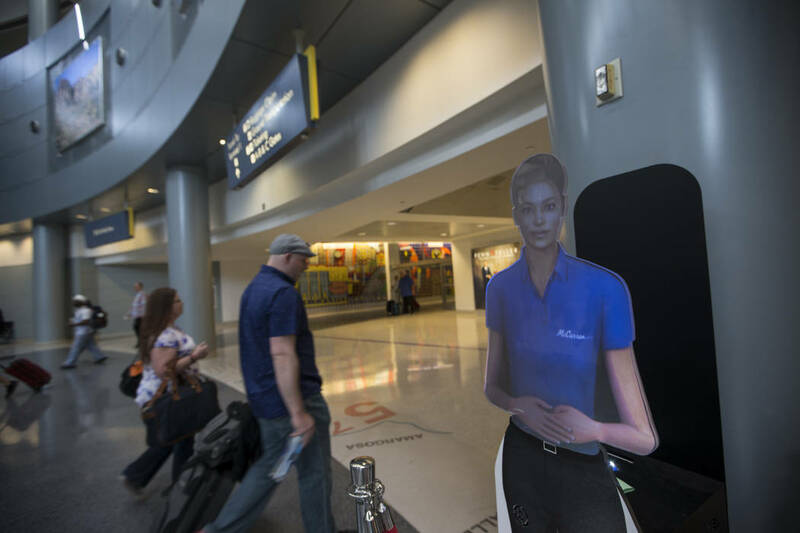 A team of three hologram workers quietly popped up at McCarran International Airport to help direct passengers toward tram connections headed out of the D-Gate satellite concourse. 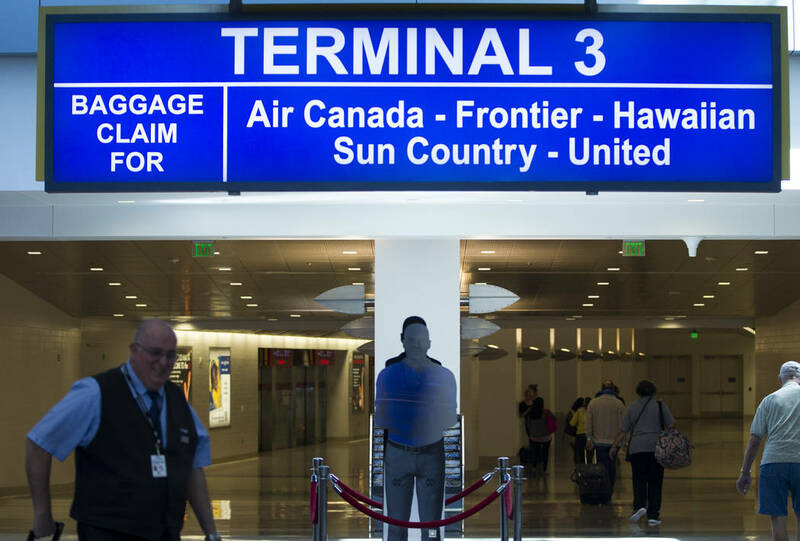 Most travelers ignore the avatars, while others might glance over. A small handful, like Brian Gladman of Toronto, Canada, stop to listen and then laugh at the cartoonish characters. 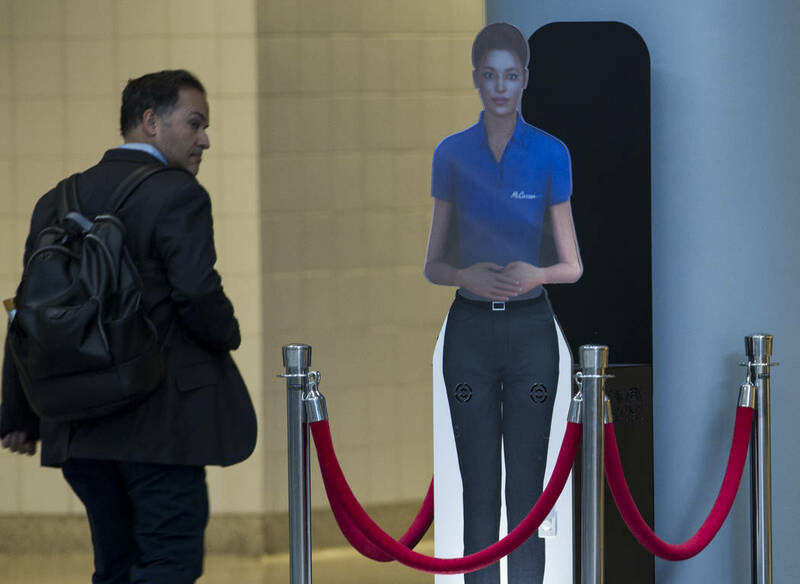 The virtual assistants were rolled into the D-Gate lobby in mid-December under a $36,000 installation and maintenance contract with PRSONAS, a hologram developer in Durham, North Carolina, airport spokeswoman Christine Crews said. 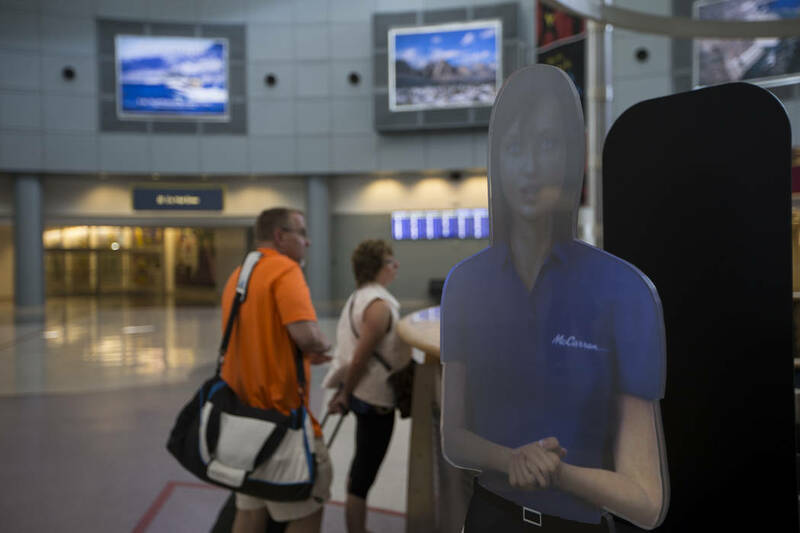 Dressed in blue polo shirts and black slacks, each figure has a different name, but their messages are generally the same. 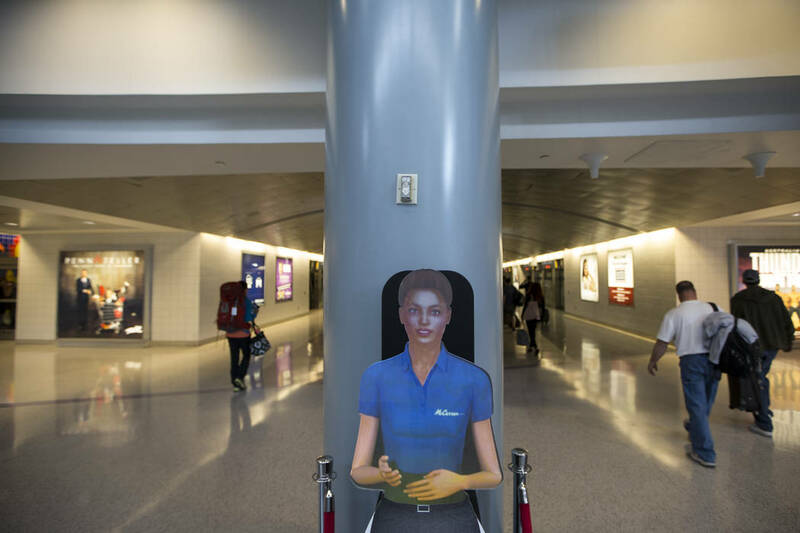 Jennifer is positioned near the blue tram leading to Terminal 1, while Adam directs travelers to the red tram for Terminal 3. 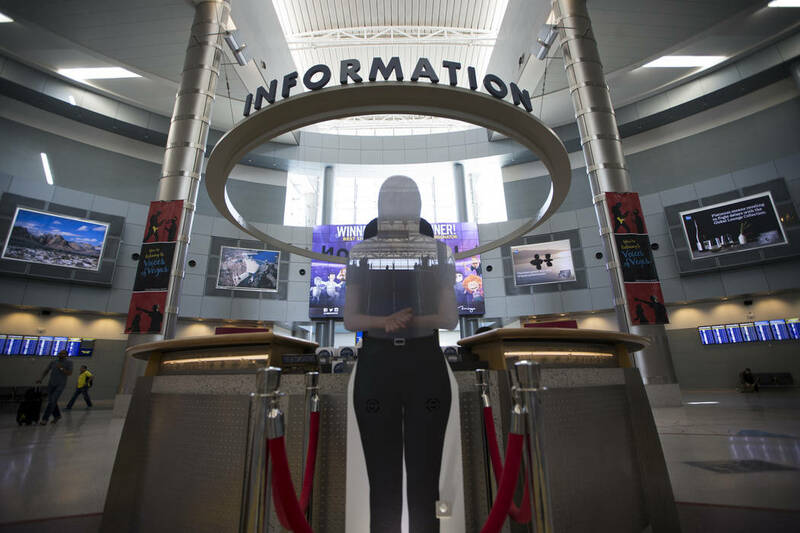 Angie gets to stand with a human counterpart at the information desk. 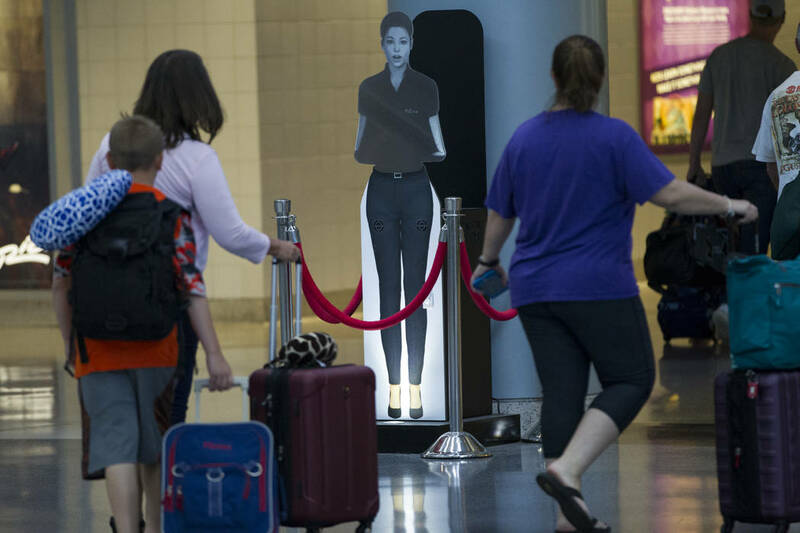 Jennifer, Adam and Angie have the capability to interact with travelers, but Crews said the option was switched off so that travelers can keep moving through the high-traffic corridor. 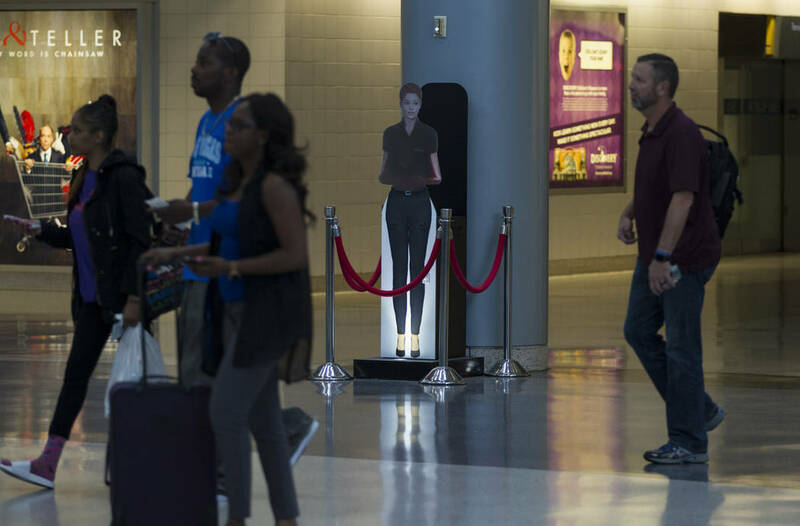 Their fixed scripts have changed in the brief time the holograms appeared at the airport. Some messages were too long, while others didn’t strike the right chord. “I like it and it’s interesting, but I don’t understand her,” Germán Huamán said in Spanish after listening to Jennifer. 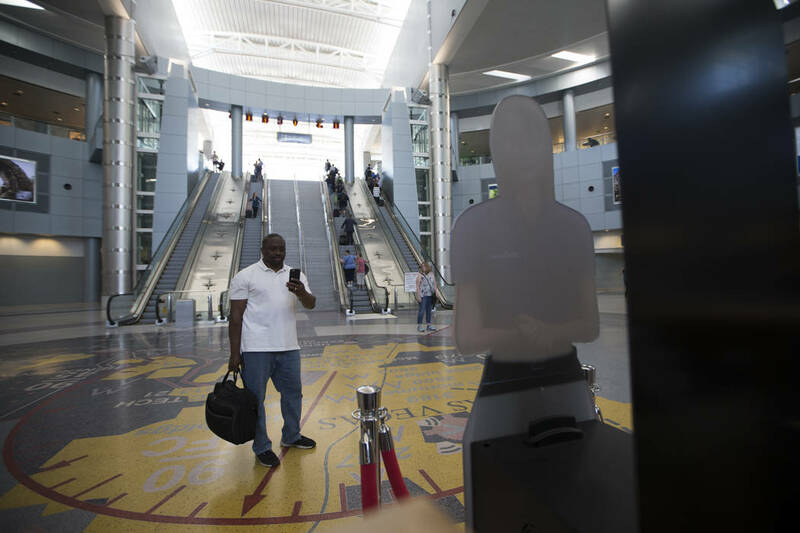 Airport officials are studying whether the hologram trio should offer messages in additional languages. “We’re trying to get the message right in English before we translate it,” Crews said. The low rumble of a muffler spewing car exhaust is a familiar sound, but William from Las Vegas wanted to know whether there was a specified noise limit for vehicles traveling on Nevada’s roads. Some vehicles, he says, make as much noise as a stock car getting ready to race down the freeway. “It sounds like I am driving at Las Vegas Motor Speedway instead of on our city streets.” William wrote in an email to the Road Warrior. There isn’t a specified decibel level that would be considered “too noisy,” but it’s definitely against the law to increase the sound of your muffler by cutting or bypassing factory-issued emission systems, Nevada Highway Patrol Trooper Jason Buratczuk said. Drivers caught with a modified exhaust system would be slapped with a $1,000 fine and required to bring their vehicles back into compliance. Keri from Las Vegas wanted to know whether the signal timing could be adjusted along Hollywood Boulevard’s intersections with Bonanza Road and Owens Avenue. A pole was damaged at Hollywood and Owens, which affected the signal timing for these intersections, Clark County spokesman Dan Kulin said. The pole will be replaced soon, he said. Like many readers, James is a fan of blinking yellow left turn signals and wanted to know whether the city of Henderson had plans to install them at two intersections: westbound St. Rose Parkway, turning left onto Executive Airport Drive, and at southbound Bermuda Road, turning left onto St. Rose. Henderson spokeswoman Kim Becker said a flashing yellow left turn arrow is “a possibility” at Bermuda and St. Rose, and the intersection will be added to the city’s study list. 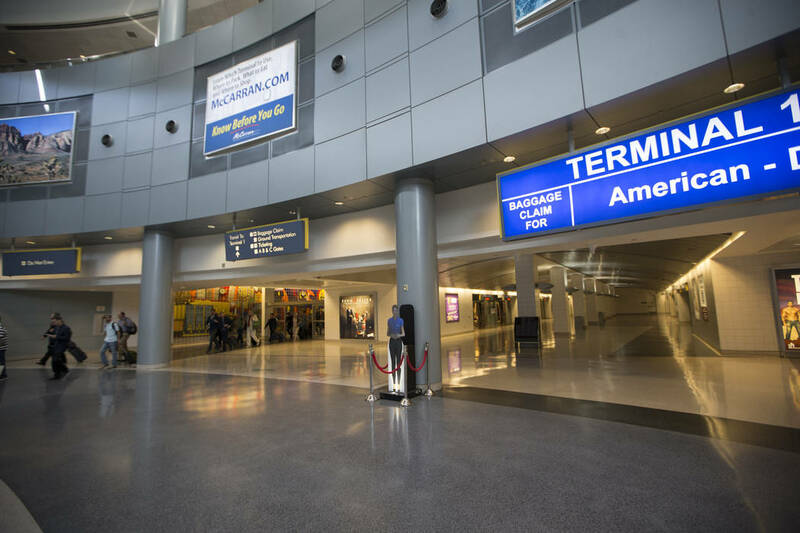 However, St. Rose and Executive Airport isn’t a good idea, because it is along a high-speed approach that makes it difficult for drivers to judge the speed of oncoming traffic, Becker said. That intersection will remain as a protected left turn solely by a green arrow signal. “The flashing yellow arrows are an efficient way to direct traffic when used in the right places,” Becker said. Main Street is restricted between Bonneville Avenue and Las Vegas Boulevard through May 28. Crews are working on a storm drain. Commerce Street is restricted between Wyoming Avenue and Main Street through May 30 for road improvements. The northbound U.S. Highway 95 exit ramp to Rancho Drive will be closed through June 21 for work associated with Project Neon. Martin Luther King Boulevard is closed between Oakey Boulevard and Interstate 15 through July. Crews are installing drainage boxes. Oakey Boulevard is closed between Main and Commerce streets through July. Crews are installing underground utilities and storm drain infrastructure. Washington Avenue is restricted between Martin Luther King Boulevard and Rancho Drive through Aug. 1. Crews are installing gas lines. Ninth Street is closed between Carson Avenue and Main Street through Dec. 31 for sewer work. U.S. Highway 95 will be restricted between Rancho Road and just east of Interstate 15 through January 2018. Crews are building a new flyover ramp for high-occupancy vehicles as part of Project Neon. Sections of Bonneville Avenue, Charleston Boulevard, Grand Central Parkway and Martin Luther King Boulevard will have closed or disrupted lanes surrounding the Spaghetti Bowl as crews work on Project Neon through July 2018. Warm Springs Road onramp to westbound 215 Beltway will be closed until late May. Crews are working on a new bridge for the Airport Connector. Nellis Boulevard will be restricted between Gowan and Craig roads through June 15. Crews are completing sewer work. Las Vegas Boulevard will be restricted between Nellis Boulevard and Puebla Street through June 15. Crews are completing sewer work. Warm Springs Road offramp from the eastbound 215 Beltway will be closed through June. Crews are building a new bridge over the highway. Farm Road is restricted south of Durango Drive through May 21. Crews are working on water and sewer lines. Rainbow Boulevard will be restricted in each direction between Hacienda Avenue and Sunset Road from 9 p.m. to 5 a.m. until mid-June. Crews are repaving the road and adding a traffic lane. Summerlin Parkway’s westbound lanes will be restricted between Buffalo Drive and Rampart Boulevard through July. Crews are building a new auxiliary lane and making other improvements. The 13-mile scenic route at Red Rock Canyon National Conservation Area will be repaved in one-mile increments through August. The average gasoline price Friday in the Las Vegas Valley was $2.65 per gallon. It was $2.68 in Nevada. The national average of $2.34 is down 1 cent from a week ago, down 7 cents from a month ago and up 14 cents from a year ago.